If you are in the midst of a sea of ideas trying to figure out what you really want as a unique border in your new or revamped landscape plan to set your yard apart from the crowd, how about incorporating a brick edging configured in a sailor curb course. 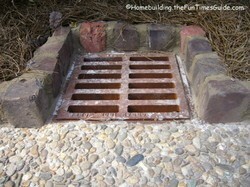 Even better…bring some color into the mix by using several different colors of brick for interest. I invite you to see the results that you can achieve incorporating character-rich, authentic handmade brick in the photos I’ve taken on-site at the English cottage home that I’ve written about here on numerous occasions. 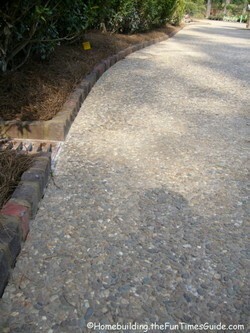 This is brick edging done right! If the look you are going for is a mature landscape (hardscape) then you ought to give a nod to handmade bricks for texture, rustic appearance and a truly unique, old-fashioned appearance. The example that appears here is in a brick sailor curb arrangement with varying colors for a look that blends with the exterior materials used to construct the home. The owners, Jerry and Julie Bonner, decided to use brick sailor curb edging all along the driveway, meandering pathways in the side yard and in the English cottage garden paths. It does a nice job of tying it all together. Are these handmade bricks used or new? The terracotta roof tiles are used (reclaimed) but the bricks used to make the edging at this English cottage home are new but you’d never know by looking at them. Each brick was handmade at the Old Mississippi Brick Company in Holly Springs, MS. With handmade bricks, the clay is formed and placed in wood molds one at a time and then placed in the dryer for 16 hours. After that they make their way to the kiln for a nice long bake of 41 hours. In all, about 60 hours are required make a brick there. There are currently only 5 plants in the U.S. that make bricks by hand. Read more about how these handmade bricks were made and some background on the company itself. Interesting read. How much do handmade bricks cost? According to the Old Mississippi Brick Co. website, machine-made bricks run around $400 per 1000 units while these handmade bricks will set you back just a little more at $500 – $550 per 1000 units. That’s not much more if you’re going for a worn, antique look. Learn (much) more about brickwork masonry and types of bond. 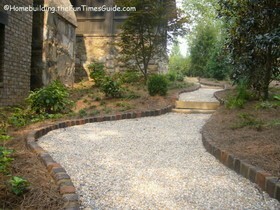 More landscape edging ideas from HGTV. Technical data available at the ASTM (American Society for Testing and Materials) website. pssst…Old Mississippi Brick Co. is also a consumer source for Heart Pine.